A nap? They sound pretty cool, I could use one of those. What’s a nap? Can I eat it? Sadly, no, this time we’re not talking about that mysterious state known as sleep1 (i.e. that thing you do in between shifts), and it’s not a type of delicious cake. We’ll be looking at the latest National Audit Project! NAPs, or National Audit Projects2, study anaesthetic-related complications, but not the common ones. They focus on low incidence complications which are potentially serious to patients and therefore important for anaesthetists to know about. Previous topics have included complications of central neuroaxial blocks3, and accidental awareness during anaesthesia4. They are managed by the Health Services Research Centre out of the National Institute of Academic Anaesthesia (NIAA-HSRC5) and edited by the Director of National Audit Projects, currently Professor Tim Cook. The 6th NAP6 was led by Prof Cook and Professor Nigel Harper. Prof Harper is an anaesthetist in Manchester, UK, who has a special interest in allergy and anaphylaxis. The project this time focused on perioperative life-threatening allergic reactions relating to administration of anaesthetic and associated medications, and is the largest ever prospective study of its type. In order to gauge overall demographics of anaesthetics across the country, they gathered data on 15,942 anaesthetics given over two weeks in October 2016, with each hospital reporting on a randomised two consecutive days during that period. They then scaled these up for a yearly estimate of over 3 million anaesthetics. Overall, 541 cases were reported to NAP6 over the year long audit period, however many of these were reviewed and excluded due to insufficient information, or not actually meeting the criteria for inclusion, so only 266 cases made it to the final dataset. Well, this is all very well Chris, but what have some reasonably sized national anaesthetic audits got to do with emergency medicine? First off, in the emergency department we’re exposed to a huge variety of patients, and in one day, individually, you could see ten patients that require input from ten different specialties. It’s important to have some awareness of key issues in other areas of medicine as it’s likely that these will impact on our management as well. Specifically for NAP6 though, this audit looked at all perioperative wards, which in their definition includes the emergency department, and so any anaesthetic interventions in the ED were reported. Admittedly, these only totalled 26 (or 0.21% of all patients in the audit), and cases of sedation given by non-anaesthetists were not included. However, maybe that means it’s even more important for us to pay attention to the findings of this audit as we see a significantly lower proportion of general anaesthetics given compared with theatre and so severe allergic reactions are even rarer with huge potential to go unnoticed. Emergency physicians and other clinicians are involved in administering general anaesthetics to patients under our care so we should be aware of the life-threatening risks associated with this. So what can we learn from NAP6? There are a few learning points we can take to the emergency department. There are so many that I’ve only been able to include a few below, but we’d love to hear from you in the comments if you have noticed something I’ve missed. 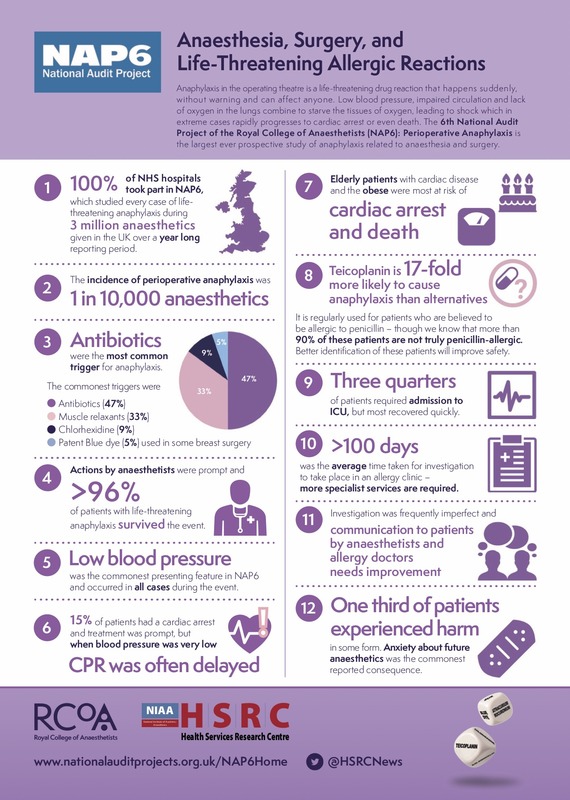 If we extrapolate the data collected in NAP6 where they found 0.21% of patients receiving an anaesthetic had it delivered in the emergency department, then this equates to around 6,500 inductions in the UK each year, and therefore only two life-threatening allergic reactions every three years across all UK EDs! There’s the potential that in the emergency department, where patients requiring emergent anaesthetic and intubation may already be unconscious and unable to give information about any allergies, or even completely unknown patients, that the incidence of reactions may be higher, but even so, these situations are exceptionally rare. This doesn’t mean we can just forget about them though. Unexpected hypotension, bronchospasm, rash or airway swelling should prompt consideration of anaphylaxis. Keep it in mind. It occurred in all cases reported and was the first feature present in 46% of cases. However, when you ask someone how anaphylaxis presents, the word “hypotension” is unlikely to be the first out of their mouth. If you give someone a drug (not just an anaesthetic!) and their blood pressure drops unexpectedly, you need to consider anaphylaxis. Patients with a very low blood pressure (<50 mmHg) but who did not have a cardiac arrest were managed less well than other patients in terms of speed of treatment, and administration of adrenaline and CPR when indicated. This was reflected in panel judgement of quality of care. The majority of these patients came to harm. Apologies to Tim, but as it was unclear to me having never seen the word antibiotic abbreviated to “ABC” I thought I would make that clear here. In the report, the authors recommend initiating CPR if the patient’s systolic blood pressure is below 50mmHg. This is controversial as Tim’s tweet above eludes to, but the key part of this is the recognition and early resuscitation through cardiovascular support, be that chemically or mechanically. I’m sure you’ll recognise that at least two of those are commonly used in the emergency department, and particularly with chlorhexidine, don’t forget that you may have central lines impregnated with this in your ED so do check about allergies before putting lines in where possible. If your patient has a severe reaction after putting a line in, that line needs to come out again. Half of all anaphylactic events were related to antibiotics. In the ED, we give a lot of antibiotics. In NAP6, they found that the incidence of antibiotic-related anaphylaxis was 4 in 100,000 administrations, however this increased to 16.4 in patients receiving teicoplanin, and 8.7 for co-amoxiclav. Teicoplanin is 17 times more likely to cause anaphylaxis than alternatives, and importantly is commonly the second line antibiotic for patients who state they are allergic to penicillin! We know that the majority of patients reporting a penicillin allergy are not truly penicillin allergic, so with the higher risks with teicoplanin it is definitely worth exploring allergies correctly in the emergency department to improve patient safety. There are so many other learning points and I would encourage you to have a read through the report, peruse the #NAP6 on Twitter, have a look at the infographic showing key findings (PDF) and have a think for yourself about how you might utilise their findings during your patient management in the emergency department. May N. Get the Best from Your Rest – Sleep Hygiene at St Emlyn’s – St.Emlyn’s. St.Emlyn’s. http://www.stemlynsblog.org/sleep-hygiene/. Published September 10, 2015. Accessed June 12, 2018. Welcome. National Audit Projects. http://www.nationalauditprojects.org.uk/. Published 2018. Accessed June 12, 2018. NAP3: Major Complications of Central Neuraxial Block in the United Kingdom. National Audit Projects. http://www.nationalauditprojects.org.uk/NAP3_home#pt. Published 2009. Accessed June 12, 2018. NAP > Projects > NAP5 NAP5: Accidental Awareness During General Anaesthesia in the UK and Ireland. National Audit Projects. http://www.nationalauditprojects.org.uk/NAP5home#pt. Published 2014. Accessed June 12, 2018. NIAA Health Services Research Centre. Health Services Research Centre. https://www.niaa-hsrc.org.uk/. Published 2017. Accessed June 12, 2018. NAP6: Anaesthesia, Surgery and Life-Threatening Allergic Reactions. National Audit Reports. http://www.nationalauditprojects.org.uk/NAP6Report. Published 2018. Accessed June 12, 2018.